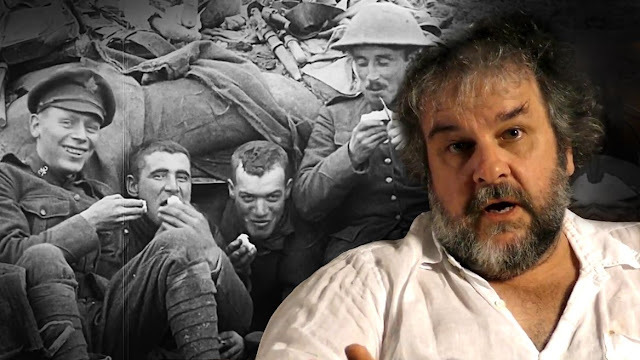 Lord of the Rings director, Peter Jackson, last week made international headlines when he announced a new documentary film based on a restoration of World War I footage from the collection of the Imperial War Museum. The results will be shown in cinemas, broadcast by BBC One on Armistice Day November 2018, and a copy will be sent to every secondary school in Great Britain this autumn. The footage will be accompanied by interviews with veterans, some recorded half a century ago for the acclaimed 1964 BBC series The Great War. Jackson's passion for World War I film goes back to his early childhood. His grandfather was born in Britain. Jackson Sr. was a professional soldier who fought in the Great War and joined the ANZAC Expeditionary Force at Gallipoli. In 1916, he was transferred to the Western Front and went over the top at the Battle of the Somme. Peter Jackson never got to know his grandfather who passed away before he was born, but his special interest in preserving the memory of World War I has been with him for as long as he can remember. We have mentioned in an earlier weblog Jackson's work on restoring the historic footage that was taken of the ANZAC landings at Gallipoli in 1915. His passion for World War I also shines through in Crossing the Line, a short film produced in 2008 that was originally intended as a collection of test shots for a new type of high res digital camera. Instead Jackson produced a stunning film on war at the Western Front, as seen from the air and the trenches. Unfortunately, Jackson never released the full movie online, but here is a link to the trailer. Watching this film makes you wish he expands on this project and produces a full-blown film on the First World War. The movie is simply amazing. In 2015 Jackson also collaborated on a World War I exhibition in Wellington, New Zealand, and who would have guessed he has a unique collection of Great War fighter planes that can actually fly? Judging from the publicity, Jackson's collaboration with the Imperial War Museum and the BBC for the upcoming documentary promises to be something quite extraordinary. For those of you who would like to know more about Jackson's interest in World War I, here is a personal interview by a New Zealand TV channel that was broadcasted in October 2014. On September 28, 2018, the trailer of Jackson's World War I film They Shall Not Grow Old was released online. The film will have its first exhibition at the British Film Institute next October and will be broadcasted later this year by the BBC. American cinematographer Ariel Varges featured before in this weblog. He shot film with the Serbian and the British army during Word War I and was in a unique position to cover the military operations in Mesopotamia (Iraq) which drove the Turks out of the Middle East. 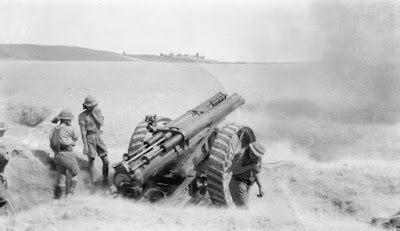 In a previous weblog we described his newsreel work with the British army from 1917 when he followed the British offensive in Mesopotamia (Iraq) and covered the fall of Baghdad. Apart from newsreels Varges also produced footage for a series of topical films that were sponsored by the British War Office Cinema Commitee. The website of the Imperial War Museum lists 21 short films in this category, which all have footage that has been credited to Varges. An interesting example is the short Norton's Column in Mesopotamia, a jumbled film of the raid into Kurdistan by Brigadier-General C.E.G. Norton's Expeditionary Force in September 1917, showing the 7th Indian Cavalry Brigade, 14th Light Armoured Motor Battery and 'S' Battery Royal Horse Artillery conducting operations towards Mandali. The footage also has a scene showing a "Turkish spy" who is brought blindfold into the British camp. The same scene appeared in the War Office Topical Budget newsreel no. 336-1, which was released in Britain in January 1918 and is credited to Varges. The film collection at the Imperial War Museum demonstrates that Varges accompanied the British in August-September 1918 during a raid into Baku (Southern Russia). He also filmed a series of test shots of British generals during the campaign in Mesopotamia, notably Lieutenant-General Sir William R. Marshall, Commander in Chief of the British Expeditionary Force, filmed wearing a cap, then a sun helmet. Apart from scenes showing the British military campaign Varges also seems to have been very much interested in covering the rich cultural heritage in the country. His films have many scenes of monuments at cities such as ancient Babylon and Ctesiphon. For a list of all of these 21 films credited to Varges at the Imperial War Museum click this link. We have also uploaded a selection of scenes from this footage on our YouTube channel. In March 1918, American reporter Lowell Thomas turned up in Jerusalem and asked to see a young British officer whose exploits were the subject of marvelled rumour. 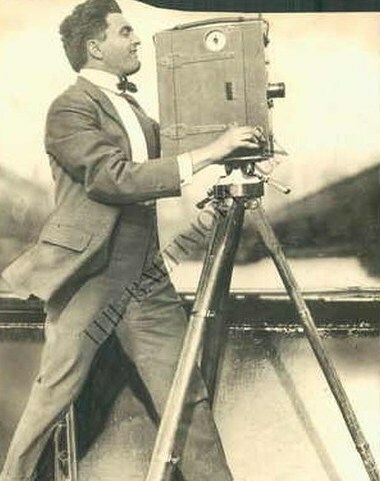 Thomas was accompanied by Harry Chase, a seasoned photographer who also carried a motion picture camera. The meeting started the film legend of Lawrence of Arabia. 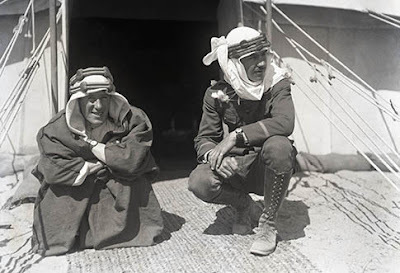 Colonel T. E. Lawrence and his role in the Arab revolt is well documented. Despite of all these sources myth has taken over from history. The man responsible for this was journalist, writer, broadcaster, traveler and film producer Lowell J. Thomas (1892-1981). In April 1917, when the United States entered the Great War, the U.S. War Department asked Thomas to report on World War I under its auspices with authorization from President Wilson. He was to gather material and stories that would encourage the American people’s support for the war. With the financial backup by a group of business men from Chicago Thomas purchased the contract of crack cameraman Harry Chase, formed a company called Thomas Travelogues, got married, and set off for Europe with his new bride, Frances, and his cameraman to cover the war. Upon arrival in France, Thomas soon discovered that the slaughter, the mud and the trenches at the Western Front were hardly suitable for a promotional campaign. So, he went to Palestine where the British forces had just conquered Jerusalem from the Turks, and this was where he met T. E. Lawrence. It should be noted that Thomas and Chase only met Lawrence briefly. Lawrence saw that Thomas’ mission could be used to help promote the little-known Arab revolt. But he wished to keep Thomas at arms’ length to protect his much-valued privacy. This is borne out in the photographic and cinematographic record. Lawrence permitted Chase to take a number of photographs of himself in Arab dress, both in Jerusalem and outside his tent in Aqaba. But Thomas only spent a couple of days close to Lawrence and never accompanied Lawrence on his campaigns. The film record also bears this out. 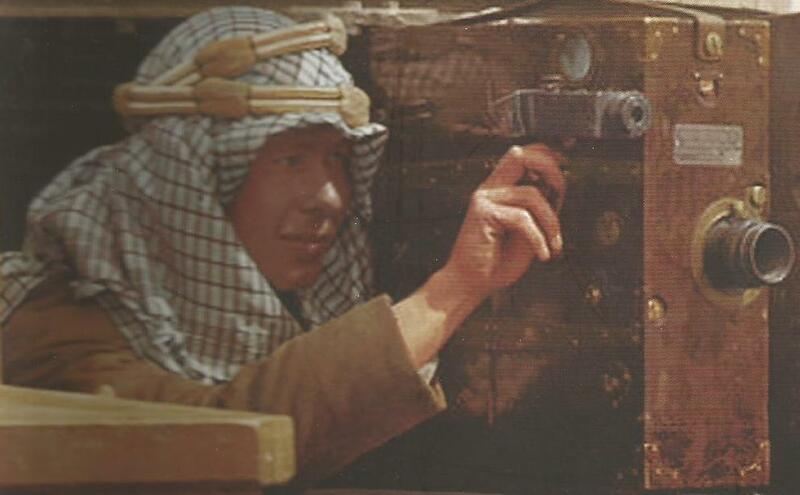 It was only after the Great War in 1919 when Thomas was showing his series of five films on the war that - much to his own surprise - he noticed the public interest was building up and more people wanted to see this strange, young British officer dressed in Arab oufit. In order to secure enough pictures Thomas organized a second photo shoot in London together with Lawrence. Then, after the publication of his book on Lawrence and the Arab revolt, Thomas edited his travelogue footage into the film With Lawrence in Arabia that was released in 1927. By then, the legend of Lawrence of Arabia had been fully established. As an interesting sideline, in December 1934 Lowell Thomas hosted a radio show in New York City and a special guest for this show was Albert K. Dawson. Like Thomas, Dawson had been a film correspondent during World War I. He shot movies in 1915-1916 with the German, the Austro-Hungarian and the Bulgarian army. Dawson was working in the tourist business then, and after the Second World War corresponded with Thomas. Here is one of his letters to Thomas. More information on Dawson can be found in our book American Cinematographers in the Great War. A complete and original version of With Lawrence in Arabia (USA, 1927) is hard to find online. The Imperial War Museum has quite some scenes from this movie, running just over 15 minutes, as well as a collection of unsorted footage. We have uploaded segments from Thomas's original movie, together with a short introduction on how T. E. Lawrence was filmed, on our YouTube channel. While researching our book American Cinematographers in the Great War, we came across an interesting collection of pictures from the collection of the National Archives in Washington, D.C. These are all from the records of the U.S. Signal Corps that was assigned to film and photograph America's involvement in the Great War. Quite a number of these photographs show the U.S. Signal Corps cameramen at work on the Western Front in 1918. Thanks to research by Harry Kidd at the National Archives these pictures have been scanned and uploaded on the internet. Finally, after almost one hundred years, we can see how these official war pictures were made. For a sample of these photographs here is a weblog showing the activities of these World War I photographers. 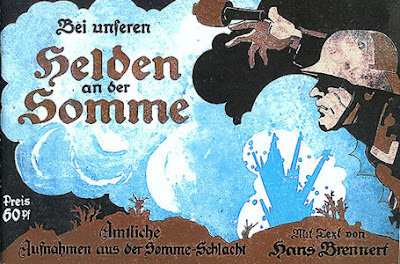 In January 1917, the Bild- und Film Amt (BuFA) released Bei Unseren Helden an der Somme. Proclaimed by the Germans as a depiction of "the German will in war", the film was supposed to counteract the enormous success of the British film Battle of the Somme. When this war documentary was shown on the screen the German authorities realized they were about to lose the propaganda war with the British. In the early years of the war the use of film for wartime publicity had been limited. 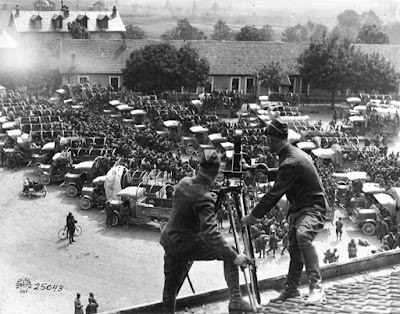 As we described in our book American Cinematographers in the Great War, it took a lot of initiative for American cameramen to cut through military red tape and censorship and make movies with the German army. The effect of The Battle of the Somme, both at home and in neutral countries, changed all of this and it must have contributed substantially to the decision by the German government to intensify official film propaganda and set up the Bild- und Film Amt. Bei unseren Helden an der Somme was BuFA’s first attempt at a feature length propaganda film and was largely unsuccessful in comparison to the British film. The film’s lack of success was due mainly to the strict censorship by the military authorities, which resulted in the absence of combat footage. Rather than sending cameramen to the front when audiences demanded this footage, the Germans created it using a combination of scenes staged in training areas and footage from previous wars. When the decision was made to produce a German film on the Battle of the Somme a problem first had to be solved: the Germans had not covered this campaign on film. Accordingly, although the first part of the film has some authentic footage, both the second and third parts were reconstructed to “show” what happened on the Somme front. These segments were compiled from films showing military trainings and previous conflicts. A forest - supposed to be at Saint-Pierre Vaast and an important fighting ground during this campaign - turns out to be completely free from damage. There are also inconsistencies in the type of helmet worn by German soldiers. Both the pickle and the steel helmet, which replaced the pickle in 1916, appear throughout the film. Yet the German press campaign that accompanied the film dwelled on the film’s excellence. With Our Heroes on the Somme was presented as a documentary, but the gap between authentic and staged scenes was too big to allow for long-term success. The Somme movie however was instrumental in setting up German propaganda strategy during the Second World War, which was aimed at total media control. A copy of this official war film from the collection of the German Federal Archives has been uploaded on our YouTube channel. In March 1916, Field Marshal August von Mackensen visited the Turkish capital Constantinopel. Von Mackensen was sent from Berlin as Kaiser Wilhelm's emissary to pay his regards to the Turkish Sultan and strenghten the military alliance with the Ottoman Empire. Mackensen - one of the best field commanders of the German army during the First World War - was filmed during this occasion. The historic footage is from the German Federal Archives and was probably taken by American cinematographer Nelson E. Edwards. The film report was uploaded by the German Federal Archives to the webportal European Film Gateway in November 2014, as part of a program to digitize contemporary films of the Great War by all of the major European film archives. The film was exhibited in 1916 in German movie theaters as part of the weekly Messter newsreel. The cinematographer however probably wasn't German, but he was an American newsreel cameraman, Nelson Edwards. Edwards' experiences as a film cameraman in Europe have been described in more detail in our book American Cinematographers in the Great War. He was sent to Turkey by the Germans in early 1916 to publicize the recent defeat of Serbia by the Central Powers, as well as the resulting celebration of German-Turkish amity. Edwards filmed von Mackensen on his arrival in Constantinopel and covered his visit to Turkey closely. Edwards was quite taken with von Mackensen, a man he described as "a fierce, swift fighter, a brilliant strategist, a doer always of the unexpected." The scenes that were shot by Edwards were shown in the Hearst newsreels in the United States in June 1916. On his return to Germany Edwards agreed to let Messter Woche newsreel use his footage by a letter dated 20 April 1916. And so these scenes were also exhibited in Germany, which explains how we found his film report of von Mackensen's visit in a contemporary German newsreel by Messter. We have uploaded this film report from the Messter newsreel on our YouTube channel.